(May 29, 2014) – The Preventive Cardiovascular Nurses Association (PCNA) celebrated the 20th anniversary of its Annual Symposium at the Marriott Marquis Hotel in Atlanta, April 10-12, 2014. The Annual Symposium is PCNA’s largest event of the year, featuring 16 hours of Continuing Education (CE), with lectures by globally recognized speakers delivering the latest information on best practices and national guidelines in cardiovascular risk reduction and disease management. At each year’s Symposium, there is a special time where PCNA recognizes the induction of each year’s fellows and presents several awards to nurses from around the world. Two of these awards are the Terry Thomas Clinical Practice Award, which recognizes excellence in clinical practice of cardiovascular prevention by nurses, and the PCNA Heart Failure Prevention Award, which is bestowed upon those who demonstrate delivery of outstanding patient care by contributing above and beyond basic job requirements in one or more areas. 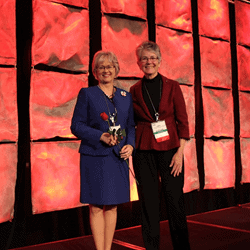 Both awards were presented by PCNA president Kathy Berra, MSN, ANP, FAHA, FPCNA, FAAN. This year’s winner of the Terry Thomas Clinical Practice Award was Denise Goldstein, RN, MSN, APN-BC, of The Valley Hospital in Ridgewood, New Jersey. Her innovative women’s health evaluation program and passion for preventive care and medicine boosted her to the number one candidate for this year’s award. This year’s Heart Failure Prevention Award winner was Mary Louise Osevala, MSN, CNS, ANP-BC, of Palmyra, Pennsylvania. Her development of a state-of-the-art program for the care of the heart failure patient from the inpatient setting through the transition to home has earned her large-scale recognition. Her endeavors have created an environment that demonstrates nursing’s significant contribution to quality patient outcomes for heart failure patients. The awards serve not only as a pat on the back for hard work, but remind everyone of the importance of patient and nurse education. The awards also affirm that nurses can and do make an impact through their commitment to patients and their tireless research and innovations in the field. Also during the ceremony, PCNA was honored to induct five new fellows. These exceptional professionals from around the country truly represent the best in PCNA membership and have shown excellence in PCNA leadership and volunteer service. This year’s fellows are: Sandra Dunbar, BSN, MN, DSN, Carol D. Marsh, DNP, RN, CNP, Marcia P. Murphy, DNP, ANP, FAHA, Sue Wingate, PhD, RN, ANP-BC, CHFN, FAHA, and Jessica L. Zweifel, MSN, ANP, CTTS.